Larnaca (Larnaka) has plenty to offer its visitors, with an existing marina for yacht owners, and a new 1000 berth marina planned in the future, as well as a lovely pier which is ideal for a stroll and take in the fresh air and scenery. Beaches are a big attraction in Larnaca, many having watersports available during the summer months. CTO Beach (also known as Pylo Beach), on the Dhekelia Road close to Central Larnaca, and Dhekelia Beach, the longest stretch of beach in Larnaca. As a seaside resort, Larnaca offers scuba diving, fishing trips, submarine trips, and many water sports. The lake, close to the airport, is a beautiful spot to visit, especially when the migratory pink flamingos are present. 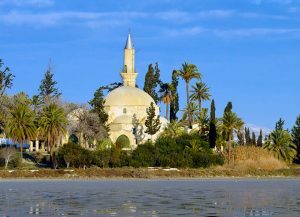 Hala Sultan Tekke is surrounded by a grove of cypress and palm trees along with the Larnaca salt lake.Along the shore of the salt lake, the Hala Sultan Tekke mosque and gardens offer a peaceful scene. This historic building was constructed in the 1700’s and marks the spot where a follower of the Prophet Muhammad died durinMuslimsiege of Larnaca in 648 AD. The mosque is a holy site for Muslims but the grounds and building are open to all visitors. The Agios Lazaros Church is a must-see for those interested in Byzantine architecture. Saint Lazarus is the patron saint of Larnaca, and this church was built over his grave in the 9th century. Visitors can see his tomb under the sanctuary, as well as the Ecclesiastical Museum which is behind the church. The museum can be seen along the Larnaca seafront. Remodeled in the early 17th century, this was formerly a Lusignan castle. It is worth visiting even just to look at the views from it, but also on the upper floor is the Medieval Museum, where you can view artifacts from Ancient Kition, and Hala Sultan Tekkesi areas. During the summer, the Fort is used for Larnaca Municipal Cultural Center events. The museum, known locally as Tornaritis, can be found within the Old Customs House, on Phinikoudes Promenade. This museum exhibits a fantastic collection of fossils discovered in Cyprus. It is believed that the oldest of these fossils are more than 500 million years old. The exhibitions are spread over five adjoining stone warehouses. The museum of natural history at the Larnaca Municipal Gardens hosts collections of Cyprus animals, exotic birds, and insects preserved by taxidermy, as well as fossils and minerals. The Archeological Museum, which can be found at Plateia Kalogreon, and housed within a purpose-built building that covers five rooms, displays an extensive collection of pottery originating from Ancient Kition and the neighboring village of Livhadia. Also displayed are old terracotta figurines, Mycenaean vases, Roman glassware, folk artworks and an authentic reconstruction of a Neolithic tomb from Choirokoitia. Kition was the ancient name of this area before it was named Larnaka. If you walk about 500 meters north-westerly from the Archeological Museum, you will find one of the most important architectural remains of a City-Kingdom. This ancient city, consisting of two sites named Kathari and Pampoula, dates back to the 13th century BC. Evidence of human habitation and religious worship were found at Kathari by excavations which uncovered five consecutive temples, as well as workshops for the smelting of copper. Evidence discovered from excavations at Pampoula show that the area was continuously inhabited from the end of the Geometric to the Hellenistic period, with architectural remains dating back to the 9th century B.C. and consisting of a temple and various other buildings. Get your free CTO map of Larnaka.